Keeping it short today. No need for a bio, or the facts. Except we've lost too many artists this year, and this one came as a bit of a shock. 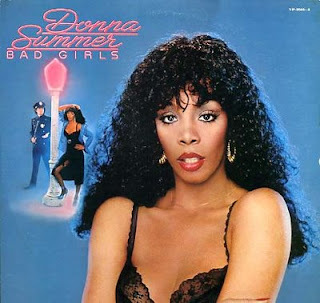 As for Donna Summer's music coming from L.A., or being especially connected here, let's point to the huge, huge Bad Girls album. Recorded in L.A., produced by Giorgio Moroder, a man with mad engineering skills and an epic 'stache, who lived in L.A. by way of Italy. New York disco had Studio 54 and the West coast had Giorgio Moroder, and Casablanca records. 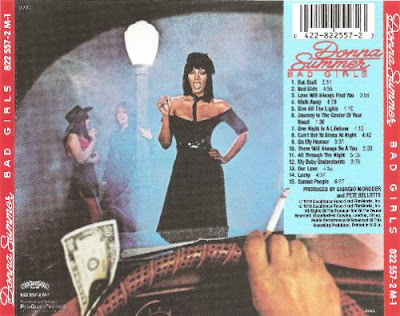 I received the Bad Girls album for Christmas in '79, the year it was released. Music, by way of albums and their cover art, was so much more tactile back then. I held that album cover, stared at it for so long. I was 11 years old. It was a long time ago. It was a double album, and not all the songs were "hits," but what else did I have to do, during those long, endless hours of early adolescence, but listen to the whole thing? Bonne Bell Lip Smackers, the big fat ones. Love's Baby Soft, which always smelled like baby powder and onions to me, or maybe it was just the heavy corduroy jacket I wore a lot that year. Satin! Satin shorts, satin jackets. I don't think I owned anything satin, but it seemed to be everywhere, in magazines and on T.V. Reading and puzzling out Judy Blume's Forever, and singing aloud to the lyrics, "Dim all the lights, sweet darlin', 'cause tonight it's all the way." Puzzling over all the photos of "bad girls" and cops in the inner sleeve of the album. What was going on here? I think I knew. I can't remember not knowing. Isn't there some space in every girls brain that intuits the whole gig, that it's all about the exchange? Money, fluids, Ralph, kisses, winks. Yeah, I understood. Hey mister! Have you got a dime? Hey mister! Do you wanna spend some time? I got what you want, you got what I need. I'll be your baby, come and spend it on me." Enjoy your Friday And...toot toot, EHHH, beep beep!